I am neither a doctor nor do I have a scientific background in the field of cancer; I am simply a young woman who had the bad luck of developing breast cancer. Editor’s note: The author of this article wished to remain anonymous. I am writing this article because I would have been glad to stumble upon it after my diagnosis. What I want to do is to spread hope and courage. In some ways, I was lucky. My tumor was found at a very early stage and was still quite small. Based on a fine-grained tumor analysis I did not receive chemotherapy. My treatment began with a surgery followed by radiation therapy. Today, several months later, I am still taking medication. When I was diagnosed with breast cancer my world stopped turning. I was scared. My future seemed to blur and slip away. And – funnily enough, a non-CrossFitter might think, but I’m sure you will understand – a lot of my fears were related to my training routine. There was however only one place where I could forget all my fears for a brief moment: the box. I often worried about the effects the treatment would have. How would my body react? Would I be able to move like before, or even worse – would I be able to continue with CrossFit at all? During surgery, the tumor and one sentinel lymph node were removed resulting in two scars, one on my breast and one in my axilla. After a surgery like this, it is quite common to experience a limited range of motion of arm and shoulder. I was therefore told to start moving and stretching my arm and shoulder as soon as possible. Now, after having gone through rehabilitation and having learned a lot about scar treatment, I know that it is essential in regaining range of motion. Scar treatment in this case means a special kind of massaging and stretching to soften the scar tissue and stimulate lymphatic circulation and drainage. It hurts in the beginning but in the long run it reduces pain and improves range of motion. I still do it on a regular basis and notice a clear difference on the days I do it. One week after surgery, I started my medication. This was also the time when I returned to the box and picked up light training again. To be honest, it was mostly about returning to my normal life. And indeed, going to the box and training with the others boosted my mood. I was really grateful to be able to do burpee step ups, or to move at all. For me and my body (and mind, for that matter), getting back to the box right away was the best thing I could have done. Of course, this is different for everyone. I soon learned to respect my body’s limits. Sometimes, I really had to remind myself what I was going through. Neither surgery nor any form of cancer treatment is a walk in the park. Even movements not directly involving the breast and axilla were sometimes a challenge because my body was still recovering from surgery. So do not try to squat your one-rep-max two weeks after surgery. I tried this for you and trust me, it is a terrible idea. Still, any kind of light training is an opportunity to focus on your body in a very positive way. We all know that focused skill or strength training as well as (scaled) WODs make you forget everything, forcing you to concentrate on movement, breathing, counting and getting through your reps.
Four weeks after my surgery, five weeks of radiation therapy followed. I continued training during the whole treatment. Many women continue to work; I decided to save most of my energy for training. I only pursued sedentary activities and did some relaxed cycling to still have enough strength to complete three workouts and one hour yoga per week. Other women have told me they had developed similar strategies during chemotherapy to keep their bodies as fit as possible. One of my friends tried to continue light strength training and cardio conditioning three times a week. Guess what? It worked. Sometimes, she only made it once a week but she kept going. In the end, she was proud not to have lost muscle mass. Considering that most patients lose muscle mass during chemotherapy, this is a great success. Another friend managed to finish her yoga teacher training during chemotherapy. Her doctors timed the medication in a way that she could still attend her weekend seminars. Cancer treatment, even chemotherapy, and sports do not exclude one another. If you do not know what to do about the port transplanted in the collar bone area – there are solutions to train with it. Talk to your doctors. I often met people who gave me unsolicited advice, telling me to exercise less. Interestingly, doctors and therapists told me the exact opposite: there is no need to reduce as long as your body feels OK. As an athlete you know your body quite well. Moreover, you are used to higher physical strain than many other patients. The only crucial adaptation is that you have to learn to listen to your body and be nice to it instead of telling it to shut up. I am sure you will soon figure out when training is a good idea and when to take it slow. National Cancer Societies even recommend to continue (or start) physical activities in order to minimize treatment side effects (like fatigue) and prevent recurrence. Besides, strength training increases bone density, which often decreases during breast cancer treatments. 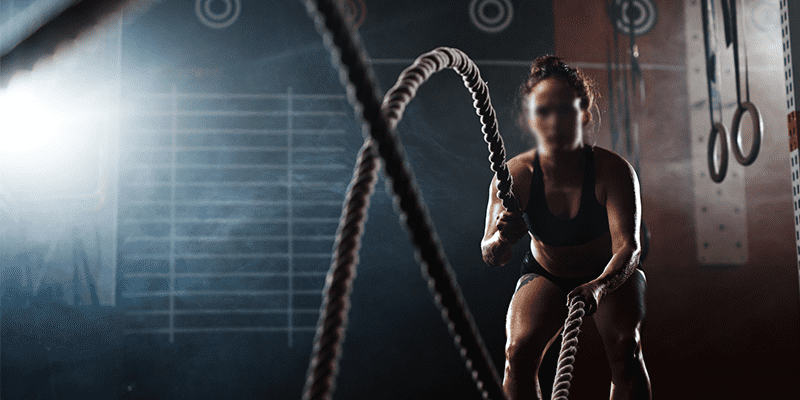 CrossFit was – and still is – what brought and brings me through bad days. Working out has had a huge impact on my mental health. And – as corny as it may sound – in a way, CrossFit prepared me for these tough times. Think of it like a hard WOD. Perseverance, the will to fight, strength and a feeling for your body will help you to get through. So keep on moving while listening carefully to your body and its needs. Talk to your doctor and then tell your coaches. Maybe you can only do step ups, or you have to scale down a lot, maybe overhead movements become hard or even impossible, maybe one of your arms will be much weaker than it used to be, and sometimes you will simply feel too worn-out to go to the box at all. But please never stop fighting. Be positive! Allow yourself to work out but don’t push yourself too hard. Be a fighter. Keep repping!